Transportation Costs > How Much Does It Cost to Lift a Truck? 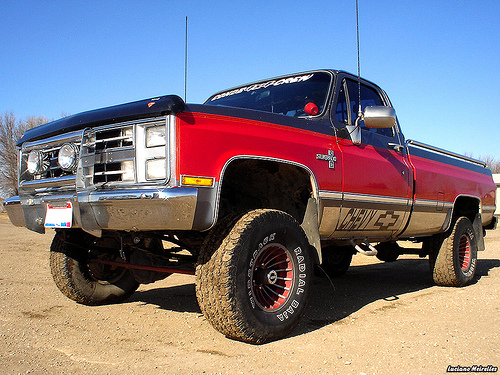 A lift kit is designed to improve the style and overall performance of a vehicle. It will also help raise the height, allowing more room for larger tires for better traction. Those who usually find themselves riding off-road or needing a higher clearance will often have a lift kit installed. How much does a lift kit install cost? In general, a lift kit, without any professional installation, will cost anywhere from $300 to $2,500, depending on your make and model, the type of kit you’re using, the components included and the height of the lift. A kit with fewer parts and a lower height, for example, will be a lot less than a kit that needs numerous parts to replace and adds a higher-than-average lift. Now, when you factor in the professional installation costs, the prices can anywhere in the $500 to $1,400 range; again, depending on the factors mentioned earlier. When you factor in the cost of the lift and the professional installation, you should be in the $800 to $3,900 ballpark. According to a few members on F150online.com, one member paid $2,000 for a basic skyjacker lift, while another paid $2,400 for a Fabtech six-inch lift. On another forum thread at JeepForum.com, a member asked his friend what a lift would cost, and he said it would be $240 for the front, $240 for the rear, $280 for the SYE/driveshaft, $120 for balancing the tires and $75 for the alignment. A block kit is designed for those who want to raise the back of the truck. These kits will often be straightforward to install and fit in the place where the U-bolts would go. A body lift kit will only affect the height of your cabin, keeping the suspension frame in place, allowing more room for larger tires. While your ground clearance won’t change, you won’t get the extra height in order to protect your vehicle’s undercarriage. Since there are fewer parts involved when compared to a suspension lift kits, the costs will be much less. Coil spacers will be ideal for those who don’t want to mess with the suspension or affect the brakes in any way. Depending on the coil spacer, some may need shock extensions while others may not, but regardless of which one you choose, the performance shouldn’t be affected. These coil spacers can install easily and will be able to elevate your vehicle by a few inches. A leveling kit will raise the front of the vehicle to level the higher tail end of the truck, eliminating any “rake” your vehicle may have from the company. This can often be an efficient option. Strut extensions are designed for a truck that has a coilover strut at the front, usually found in SUVs. Essentially, with this type of vehicle, it will require a spacer implemented to create the lift. These kits, often installed by off-road enthusiasts, will be more expensive than a body lift kit due to the parts and labor involved With a suspension lift kit, your entire vehicle will raise to a designated height, including the suspension and the frame. This will create a lot more ground clearance and enables you to install larger tires. A torsion key will operate in combination with the leveling kit we already mentioned. These keys will enable you to install the company torsion sections and replace them with keys that let you lift your car. Often costlier than other methods, it can be one of the simplest methods when lifting. Most lifts are relatively straightforward. A professional installer will lift the car up and hold up the frame with a jack stand. The track bar and sway bar links will be disconnected at the axle and the shocks will be removed. The axle will then be dropped until the springs come loose and the older coils will be removed, followed by a replacement of the new coils inside the kit. The axle will be re-seated, the shocks will be bolted on and all loose parts will be reattached. This process will then be repeated on the front/rear. Most professionals can do the job in less than seven hours, depending on the setup. Popular lift brands include Pro Comp, Daystar, Rancho, Fabtech, Skyjacker and Superlift. The prices quoted above will only include the lift kit and professional installation. After the lift kit has been installed, you will need a professional alignment to make sure everything is lined up properly. Some installers may include the alignment inside their quote, while others may charge you extra, anywhere from $50 to $200, depending on the setup. If you were to do the job on your own, factor in the additional tools necessary to perform the job. According to TruckSpring.com, you will need tools such as a jack stand, wrenches, spring clamps, tire stops, a breaker bar, lubricants and more. Depending on the lift, you may have to modify existing parts to successfully install the lift. All results will vary. Some vehicle owners often install high-performance shocks in order to avoid damage. While optional, a higher quality shock can cost upwards of $800 without the professional installation. The same can be said about tires, especially those who plan on doing a lot of all-terrain driving. Call some shops to see what the going rates are. As long as you know what kind of lift you want, they should be able to provide a ballpark estimate over the phone.